Its funny that that there is no easily accessible definitive answer, I've seen a couple claim the same and or marginal weight gains with the ls when staying in race trim (no ps or abs on an all aluminum setup). I've even got 1 thread I've seen that full ac and ps setups tipped the scales 27 pounds over rotary weight, with about 50-60 pounds more on the read axle and the front actually being lighter (due to a majority of weight being low in the transmissions area). I have a full belt 87 FC race car with a SBF and T56. Dry weight is 2590 and weight balance is 53F/ 47R. I could probably take maybe 60 to 70 pounds more out of it. With fuel and driver weight its 2845 LBs. If I had used an aluminum LS I'm sure I could have the car at around 2300 and change dry and better balance of course. To get the definitive answer one would have to buy a scale, buy the parts and document the weights. However, most all the people doing LS V8 swaps into RX-7s aren't obsessed with weight, so they don't bother to document weight that precisely. They just want an RX-7 with plenty of reliable power and smog legality is a big bonus to some. I was more curious about weights than V8s (heyyyyyyyyyy), so I purchased a high capacity digital draw scale (they are cheap now). So far I have learned my full accessory, stock 13B-REW with oil/coolant drained and no downpipe weighted 407lbs ( I was expecting 420lbs). Results will vary. Holy shmolies! They were right! Ive heard in a FC, LS1 weighs 100lbs more than a 13bt, aftermarket turbo with a FMIC setup. Fully dressed LS V8 engine (497lbs) is right around 90lbs more than a stock fully dressed 13B-REW engine (407lbs). The 13b is also shorter (farther back in the bay) and the CG is lower. But, I doubt 95% of people could care or tell about the weight difference. I heard about the weight ratio, is the LS1 takes it from 50:50 to 51:49, which really should be hardly noticeable. Not sure how to calculate it. my full accessory, stock 13B-REW with oil/coolant drained and no downpipe weighted 407lbs ( I was expecting 420lbs). Results will vary. I weighed my modified 13B-REW again before putting it in. Power steering and simplified stock sequential turbos. Weight reduction- emissions delete, AC pump delete, lightweight pulleys, manifold porting, dirt/grime removal. The takeaway is an emissions strip and AC delete takes 50Lbs off a stock 13B-REW. my 84 Rx7 weighs 2920lb with me in it and about 1/2 a tank of fuel. Last edited by 455dan; 12-03-18 at 07:03 PM. That username is awesome! The engine weight with a manual transmission can easily be lowered with aluminum flywheel... Back in 2005 I had a heads/cam LS1 making 440rwhp and it was pretty much 50/50 with 285/30/18's at all corners and 2800lbs with a heavy dual 3" mild steel exhaust and stock body panels. On the skidpad it did 1.13g's and handled great with fast turn in. 18x12's, 438ci LS7 with G-Force 4spd dog box (80lbs) running a 14lbs clutch/flywheel.... fully gutted, fiberglass doors, fulll cage, tubed front clip, CF hatch, lexan front/rear windows, no side windows, no a/c, basic aluminum dash with display.. and it was 2470lbs with 8 gallons of fuel. That car ripped on the track. 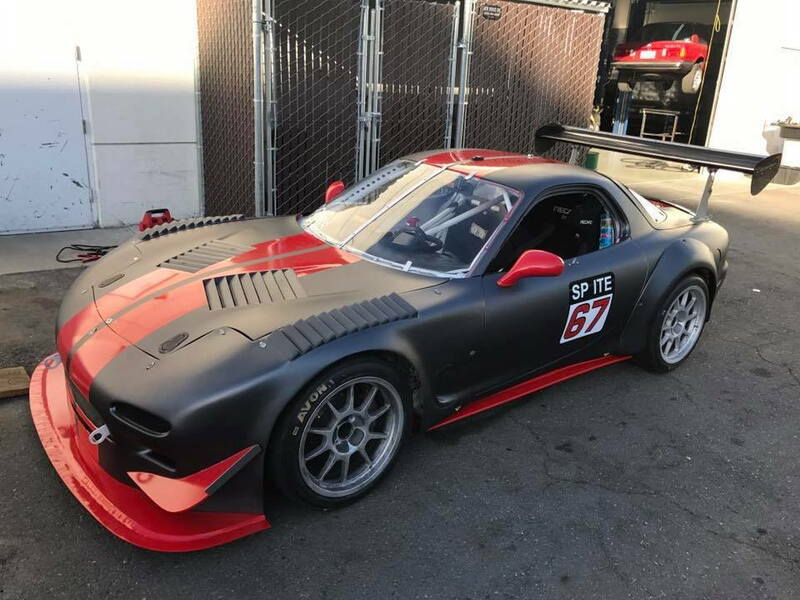 This picture is when the new owner had it and repainted the car plus added some front aero work.... did a MAST Motorsports $20K 416ci engine, Quaiffe sequential trans, and other goodies! The car had about $100K into before he bought it... then he put easily another $40K into it after I sold it to him. Last edited by gnx7; 12-03-18 at 09:58 PM. The CG of a rotary is actually pretty high,when you factor in that the oil pan has to necessarily be short and flat, so the whole mass of the engine has to sit over any crossmembers. The high crank centerline means the drivetrain has to sit high as well. It's kind of the same problem that Subarus have. Yes technically the CG of the engine is low relative to the crank centerline, but open the hood and you notice that the crank centerline is actually as high or higher than the top of the bumper. One has to view the whole relationship of flywheel ring gear diameter, oil pan depth and crank/eccentric shaft center line. We have had some V8 guys on here that weren't stupid, but still thought the rotary CG was higher than an LS despite the LS having a larger diameter flywheel, the oil pan still protruding below the flywheel and having two heads attached to the block which itself is further above the crank center line (9.25" deck height) than the rotary keg itself. Each complete head is 30Lbs for 60Lbs verus 20Lbs for (single) 13B-REW complete intake, 8 coils on top of the heads versus 4 on top of rotary keg. 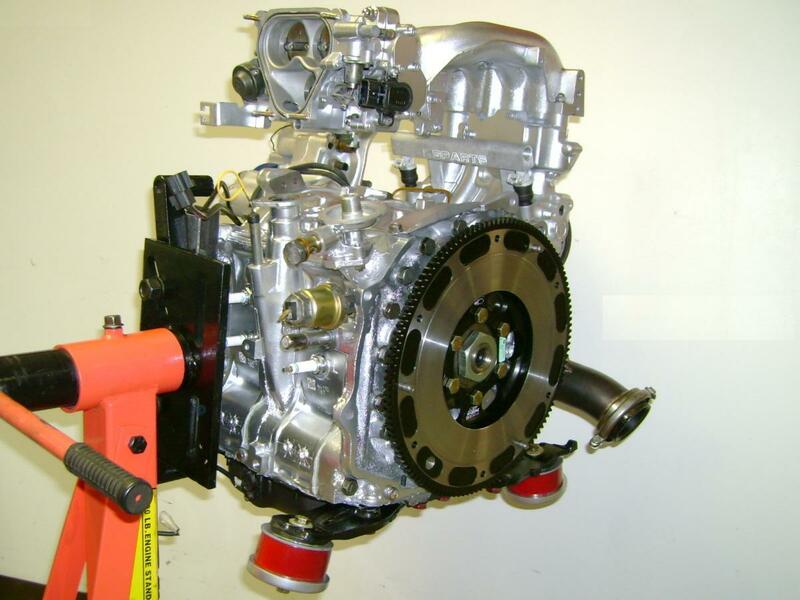 Drysump LS V8 with T56 transmission (14" flywheel diameter) = 7" from crank shaft center to bottom of flywheel. Wetsump 13B with low profile RX-8 or RX-8 swap oil pan = 8.1" from eccentric center line to bottom of oil pan. Wetsump LS V8 with low profile F body or swap oil pan= 7" from crank shaft center to bottom of flywheel and same 7" to bottom of oil pan. Stock 13B-REW= 9.25" from eccentric shaft center to bottom of oil pan. Stock LS (anything except F body/corvette)= 11" from crank shaft center to bottom of oil pan. Knowing the rotary eccentric shaft center and the LS V8 crankshaft center are about the same it really changes how top heavy the LS mass appears doesn't it? All out LS V8 with custom smaller diameter flywheel, bellhousing, starter and the dry sump. LS block is a deep skirt design where the main bearing caps have additional bolts through the block skirt. I don't have the exact measurement from the center of the crank to the bottom of the skirt, but I believe it is around 2.5". On a lower displacement LS the rod swing minimum depth past the skirt is 3.6" and closer to 4" for the higher displacement (7.0) LS, plus 1/8" CNC dry sump pan below that. I believe with lost of $ you could get a dry sump race LS down to 6.225" from crank to bottom of dry sump pan for a low displacement/stroke LS and more like 6.5" for an LS 7. Again, about the same as the 6.5" with the MFR 13B dry sump with usual thick 0.25" dry sump plate; 6.37" with 0.125" dry sump plate. Its just all that mass above the V8 crank that makes it look like the crank center line is lower than the 13B. I'm not seeing it, though. You can set an LS down to where the damper is touching the rack, there is no way to get the crank centerline that low on a rotary unless you lay it on its side like the airplane guys do. And the transmission is going to be sitting a bunch higher, as a result. Corvettes are an interesting take because I am convinced that part of the reason for having the transaxle is so they could set the engine lower in the chassis. GM automatics hang down really low from the crank centerline (as do most RWD autos) and by putting the trans in the back, they could srt the engine down so low that the flexplate practically drags on the ground, and cut the oil pan depth to the bone. It was kind of an eye opener the first time I saw a C5 in 1997 and saw that the tops of the tires were about the same height as the top of the engine! Well, the smaller of the two LS front pulleys is 7.5" diameter and the 13B-REW front pulley is 4.5" diameter. That is 1 1/2" right there the LS has to be higher above the rack. 13B-REW would need to be set further back or with a notched/custom front subframe to get the pulley over the rack since the bottom of the engine even with drysump plate would hit the front subframe before the little pulley would hit steering rack. Logan at Defined has done this sort of front subframe modification. Or you can use the shorter RX-8 transmission and it sets the 13B back to where the front pulley could be under the level of the steering rack on an 1st gen, 2nd gen or RX-8 with the open rear front subframe. The Transaxle in the vettes are the same transmissions used in the Camaros bolted to a rear diff. They could be as low if they were bolted to the engine. 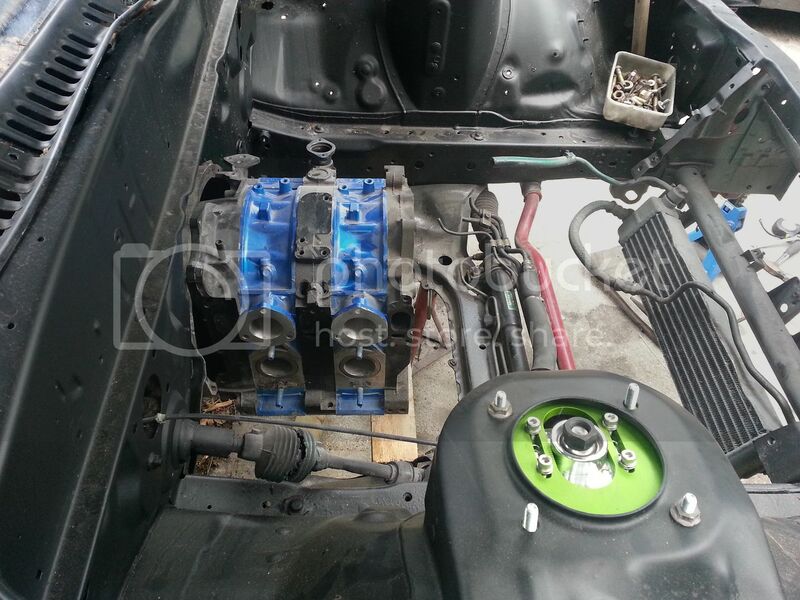 Front engine with rear transaxles are normally done for weight distribution. The high drive-line/eccentric shaft is the blessing Rx-7 owners needed to have pretty much most transmissions fit without having to cut much if anything out of the floor.